 Semimedical thriller by Wilson, a practicing physician (Deep as the Marrow, p. 95, etc.) and sometime horror novelist (The Select, 1994, etc. 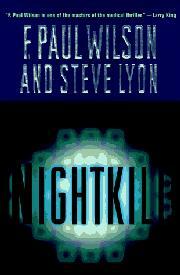 ), who joins Lyon, also a novelist of medical thrillers, to produce a mob/medical story without a hint of the occult. Jake Nacht, a hit man with 17 kills, works for the mob on a freelance basis. As he sees it, he's helping haul out the trash by killing mobsters. An orphan, Jake is the adopted son of Sarge, an ex-Marine sniper with some 250 wartime kills. Sarge, who may or may not be psychotic, served for some time as a mob assassin, and has done well by his efforts. He trains Jake to perfection, then dies in a confrontation gone wrong: He forces Jake to kill him in a variation of ``the most dangerous game'' of human hunting human. Later, the remorseless Jake quickly becomes one of the mob's most reliable freelancers--until, that is, he's caught in a double- cross. Mr. C., a mob godfather, has his henchman Fredo hire Jake to kill US Senator Weingarten during a speech at an outdoor rally. Despite misgivings, Jake sets about the job, but just as he's about to take the senator out he learns that he's been set up. Shot by a detective who's been tipped off to his presence, Jake is paralyzed, his spine severed. But there's no evidence against him, and he's likely to collect a cool $5 million from the city. It doesn't matter: A depressed Jake starts on rehab convinced that he would rather die. Then nurse Angela and her uncle Dr. Graham sneak him into a new, highly experimental program aimed at rebuilding spinal cords. Jake recovers, secretly, and sets out to avenge himself on Mr. C and Fredo. Fast-moving, yes. Inventive, no.